Last year Congress passed the first meaningful improvements to the Visa Waiver Program (VWP) in some time, in acknowledgement of the elevated threat we face now from terrorism, espionage, and the inappropriate transfer of technology to our enemies. These sensible and modest changes will allow for more scrutiny of certain travelers coming from VWP countries, based on their dual nationality or their travel history, by requiring them to get a visa.1 The ink from the president's signature on the law was barely dry when the Obama administration significantly undermined these reforms by unilaterally offering waivers that were not authorized in the law.2 This is a problem — not only because it is a flagrant abuse of executive authority and a breach of the agreement with Congress, but because the administration's plans will expose our nation to real threats. One of the categories of travelers the administration has carved out for waivers — dual nationals traveling to Iran and Iraq for business purposes — is precisely the category of travelers that needs to be scrutinized more closely because of past cases of espionage and illegal technology transfer. The risks inherent in the VWP are compounded by the president's tendency to allow the admission of increasing numbers of foreign visitors, gloss over the threats, over-sell his agencies' ability to screen out risks, and suppress the enforcement of immigration laws in the interior. Impact of VWP Changes. The new rules spelled out for the VWP are sensible and narrowly focused. They affect only those travelers from VWP countries who have traveled to Syria or Iraq in the last five years, or who are dual nationals of Syria, Iraq, or countries on the official list of states that sponsor terrorism (currently Iran, Sudan, and Syria). These travelers are not barred from entering the United States; they simply have to apply for a visa to travel here, just like travelers from most of the rest of the world. There were sound reasons to impose these restrictions, as shown by the examples described below. The immigration systems of both Europe and the United States already have been exploited by nationals of such countries linked to terrorism who, when undetected, go on to become citizens of their new homes even when they actively work against them as agents of their prior government, or as terrorist operatives or supporters, whether by fighting abroad or attacking the countries in which they reside. These are the "dual nationals" to whom the new proviso was directed. While we can do nothing about dual nationals of mal-intent who have infiltrated our own system until they are detected, there is no reason to take unnecessary risks with foreign dual nationals emanating from the countries specified; thus the new consular interview requirement. Obama Administration Immediately Caves To Iranian Demands. Within weeks of the passage of the new rules, the government of Iran formally declared its objections, suggesting that the new rules violate the recently concluded and highly controversial nuclear "non-treaty" agreement between Iran and the United States and other nations, and that they will adversely affect "economic, cultural, scientific, and tourism relations". Presumably they meant that Iranian dual nationals or other VWP country citizens who wish to travel to Iran might be discouraged from doing so because they would then lose their VWP privileges for the United States. This is, at best, highly speculative. Yet on December 19, Secretary of State John Kerry sent a letter to his Iranian counterpart, Minister of Foreign Affairs Mohammad Javad Zarif, assuring him that the administration would adhere to its treaty commitments and pledging to use a variety of immigration "tools" to facilitate travel to Iran, including the authority to waive the new VWP restrictions. When the State Department formally announced the implementation of the new rules on January 21, it also announced that waivers would be offered to five categories of travelers who would otherwise be subject to visa requirements, including individuals who traveled to Iran and Iraq for "legitimate business-related purposes". The announcement said that, in addition, the administration would "continue to explore whether and how the waivers can be used for dual nationals of Iraq, Syria, Iran, and Sudan." Congressional Displeasure Is Justified. Congressional leaders are rightfully angry about this move. The law provided the executive branch with the authority to issue waivers only for those dual nationals who were serving in military or civilian government jobs — not for journalists, aid workers, or business travelers. House Homeland Security Chairman Michael McCaul and Rep. Candice Miller, the author of the bill, issued a strongly worded statement, saying, "The Obama administration is blatantly breaking the law, a law the president himself signed. ... [He] is again putting his relationship with Iran's supreme leader over the security of Americans." House Judiciary Chairman Bob Goodlatte said, "The Obama administration is essentially rewriting the law by blowing wide open a small window of discretion that Congress gave it for law enforcement and national security reasons. ... In fact, the categories of people that the Obama administration is exempting from the law were expressly rejected by Congress." The administration's assertion that waivers will be offered on a "case by case basis" should be met with some skepticism based on past application of this phrase. General VWP Risks. There are some benefits to the United States in offering visa waivers. These include the decreased workload for U.S. consular offices and the increased convenience of foreign travel to the United States, which benefits the travel and tourism industry, and the businesses that support it. But these benefits have to be weighed against the risk of facilitating the admission of travelers who pose a threat. This threat is at an elevated level today. Terror organizations such as ISIS are openly waging jihad on western nations, and have succeeded in carrying out and inspiring sympathizers to carry out attacks in Europe and the United States. Many of these warriors are citizens of countries that participate in the VWP and may travel to the United States without undergoing the scrutiny of a visa interview. In addition, there are three nations designated as state sponsors of terrorism (Iran, Sudan, and Syria) and others, such as Iraq, where terrorists and sympathizers operate. Agents for these nations and groups sometimes have or obtain citizenship (and passports) from countries that participate in the VWP, in order to facilitate their international travel and conceal travel to countries of concern. In addition, my organization has identified more than 50 naturalized U.S. citizens who have been charged with serious national security-related offenses such as terrorism, spying, and theft of sensitive information and technology.6 These individuals came from countries such as Iran, Iraq, Yemen, China, Libya, Pakistan, Somalia, and Kazakhstan, among others. Many were already associated with terrorist groups or foreign intelligence organizations when they naturalized. Eight of the individuals we identified were born in Iran, and their crimes included violating the U.S. embargo, plotting an assassination, exporting equipment related to uranium enrichment, operating an unlicensed money wiring business between the United States and Iran, conspiracy to export military aircraft parts to Iran, illegally providing satellite technology to Iran, and exporting missile components to Iran. Clearly, dual nationality is a vital and frequently used tool for terror and espionage operations. Number of VWP Entries Has Been Rising. According to data from U.S. Customs and Border Protection (CBP), in 2014, the most recent year for which data is available, more than 20 million visitors were admitted under the VWP. Use of the VWP has increased 24 percent since 2008 (see figure below). This represents an additional 4.8 million admissions in 2014 over 2008. That is a very significant increase in cases that need to be vetted by our screening systems and by CBP's immigration inspectors at the ports of entry. 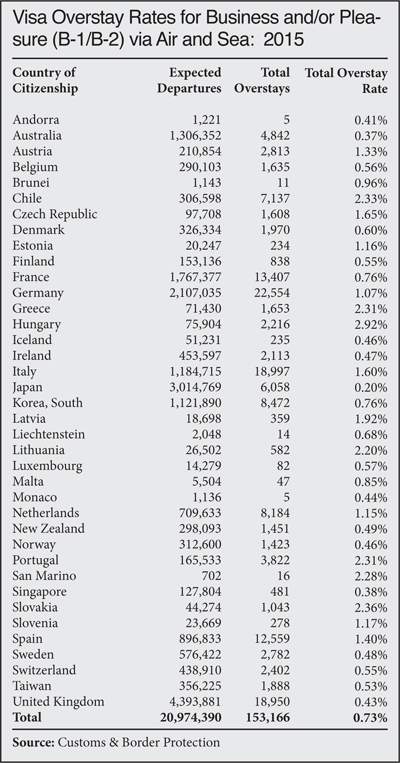 According to other data in the recently released 2015 DHS Entry/Exit Overstay Report7 (see table below), approximately 14 million (68 percent) of the VWP visits were from people who entered using passports of European Union member nations. These are the nations in Europe that have been most affected by the recent flood of migrants from trouble spots in the Middle East, and where terror groups have already had success in recruiting new operatives. Any country on the VWP participant list could have dual nationals of concern who are taking advantage of lax VWP entry rules, though. New DHS Report Confirms Widespread Abuse of VWP. The aforementioned DHS overstay report confirms that the VWP is frequently abused; in fact, VWP overstays make up 29 percent of the total number of overstays by visitors admitted for a short-term visit (B-1/B-2 category) in 2015. The total number of VWP overstays in 2015 was 153,166. VWP Creates an Enormous Haystack of Visitors to Track. The huge number of visitors entering under VWP, with a large number overstaying, is an enormous pool of foreign visitors to try to screen and track, and really is beyond the capacity of our homeland security and counter-terrorism agencies. According to testimony last month before the Senate Judiciary Committee, DHS devotes very few resources to monitoring or enforcing the law against overstayers. At the hearing, Craig C. Healy, the assistant director for national security investigations at ICE, testified that only about 1 percent of the suspected overstays are ever investigated. Currently there are only about 3,000 overstay cases being investigated, and in 2015 only 1,910 overstayers were arrested by ICE. Existing Screening Tools for VWP Travelers Are Inadequate to the Threat. The last major improvement to the VWP was fully implemented in March 2010, when DHS began enforcing a requirement that all travelers complete a pre-travel electronic screening application, known as an ESTA (Electronic System for Travel Authorization). This pre-travel screening collects important information on VWP travelers and has enabled officials to do database and watch list checks on them prior to arrival in the United States. Very little information has been disclosed to the public about the effectiveness of ESTA in preventing the travel of individuals who pose a threat. We know from a GAO report9 and other sources that tens of thousands of travelers are denied ESTAs each year, but we do not know the reasons, their countries of origin, or their reasons for travel, and we do not know how many were subsequently allowed to obtain a visa, or how many abused their admission to the United States. So neither lawmakers nor the public really have any way of knowing how effective this screening is. DHS did recently add a number of useful new questions to the application as the threat from westerners who fought in Syria and Iraq became more apparent, but still we lack good information on how well ESTA is working. We do know that ESTA screening relies on the same sources of information, intelligence, and records as the rest of our immigration system, and we know that those systems have major gaps. Notwithstanding the confident claims of Obama administration officials about the thoroughness of our vetting, in fact virtually every visa or immigration program we operate has been used by terrorists or criminals. San Bernardino terrorist Tashfeen Malik, Iraqi terrorists admitted as refugees, and the Nigerian "underwear bomber" are some of the most recent concerning examples. Questions have been raised following the Boston Marathon bombing, the San Bernardino attack, and in the debate over the admission of refugees from Syria about the adequacy of DHS intelligence gathering, analysis, and sharing in identifying threats and preventing terrorist activity. It has been reported that some of the terrorists who participated in the November Paris attacks would have been able to use the VWP because they were French and Belgian citizens, and they likely would have made it through our screening process because even though some were known to counter-terrorism officials in those countries, they were not on U.S. watch lists. It has also been reported by former DHS agents that information on possible national security threats has sometimes been scrubbed from government databases, allegedly for political reasons. Given this backdrop, it is not clear why the administration has so much confidence that it will be able to detect threats among the Iranian travelers for whom it will waive the interview rules. Specific Risk of Dual National Business Travelers. Iran's official objections to the new rules were based on concerns about the economic impact. It is more likely, in my opinion, that Iran's concerns stem from the fact that it has an extremely comprehensive, effective, and aggressive intelligence program that expends substantial time and resources targeting U.S. military equipment, plans, and programs, as well as "dual use" technology whose export is restricted. As noted above, several naturalized U.S. citizens and natives of Iran have been arrested, convicted, and sent to prison in recent years after stealing or attempting to steal defense or technological equipment or secrets for export to Iran. Iranian officials refer to these convicted spies as "Iranians" and "ours", despite their U.S. naturalization. There were 14 Iranian citizens who were let off charges as part of the swap negotiated last month trading Iranians arrested in the United States for espionage and technology transfer for Americans imprisoned in Iran. As one of my colleagues, CIS Fellow Dan Cadman, has written, in the world of espionage, handing off stolen material and other secrets is tricky business, and one of the times when spies are most vulnerable to discovery. Continental Europe, with its freedom of travel for European Union (EU) passport holders, is one transshipment center for the military and dual technology equipment, and no doubt also for plans and technical schematics. What better way for the U.S.-based foreign intelligence agent to get rid of the goods than through dead drops and brush-passes with EU-based operatives coming here via the VWP, who then take on the burden of getting them out of the United States and into Europe on their departure? In our country, immigration and customs exit controls are nearly nonexistent. "Case by Case" Consideration of Waivers. The administration's announced policy on the granting of waivers clearly goes beyond what is proscribed in the new law, which provides for waivers only if it is "in the law enforcement or national security interests of the United States", and only on an individual basis, not for an entire group of individuals defined by the administration. The announcement also said that waivers would be granted on a "case-by-case basis", a phrase familiar to all observers of previous episodes of the Obama administration's abuse of executive authority. Whether in the context of the Deferred Action for Childhood Arrivals program, the mass issuance of work permits, or the exercise of "prosecutorial discretion", this phrase, when employed by the Obama administration, has usually meant "the default decision will be approval and only the most obviously and egregiously unqualified applicants will be refused." These objections are unfounded. Visa waiver privileges are neither an entitlement nor a human right, and the U.S. government ought to be weighing national security needs as a higher priority than the convenience of travelers. The government need not apologize for differentiating between groups of travelers based on factors such as country of origin or where they have traveled. The real issue here is dual nationality, not "second-class citizenship". The fact is that people who retain more than one nationality are indicating that they have not fully renounced their allegiance to their country of origin despite attaining citizenship in another country. Some people have dual nationality for sentimental reasons, others for the convenience of having multiple passports, and some do it to facilitate illicit activity, including espionage and terror. But it is fundamentally a personal choice. And it is not reasonable for those who choose dual nationality to be able to pick and choose which nationality will apply in which circumstance; if Iranian-Americans still want to be Iranian citizens, then they cannot legitimately object when other countries treat them like Iranian citizens who live in Iran. And, frankly, this is not a matter of life or death; the issue here is the possibility that VWP countries will now require them to obtain visas for travel to those countries. Others have argued that there is no basis for the VWP changes because no Iranian-Americans have "become radicalized or committed acts of terror". But there have been Iranian-Americans involved in terror plots. In October 2011, Manssor Arbabsiar, a naturalized U.S. citizen who was a native of Iran, was arrested and charged for plotting with an Iranian co-conspirator to assassinate the Saudi Arabian ambassador to the United States. U.S. official have alleged that the plot was masterminded, or at least approved by, the Iranian government. In addition, there are a number of Iranian-Americans who have been convicted of technology transfer and espionage; these individuals are no less a threat to national security than those involved in violent terrorism. Indeed, when foreign nationals are prosecuted for nuclear technology transfer crimes, they are often described as terror-related. Finally, some Iranian-American dual nationals have argued that the new rules unfairly "scapegoat" Iranians, when there have been more terror attacks carried out by citizens of other countries, including Saudi Arabia, Pakistan, and Egypt. They have a point; not about "scapegoating", but about the threat from jihadists from other countries. It would be wise for our government to consider similar restrictions for VWP dual nationals from these countries, too — and the legislation provides some opportunity for the executive branch to do that. 1 See Dan Cadman, "A Brief Analysis of H.R. 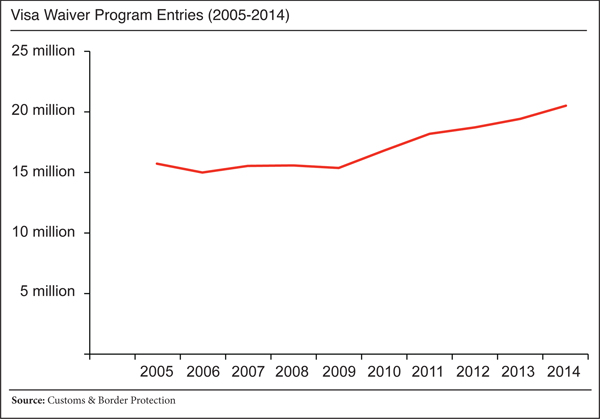 158, the "Visa Waiver Program Improvement Act of 2015", Center for Immigration Studies, December 2015. 2 "United States Begins Implementation of Changes to the Visa Waiver Program", U.S. State Department, January 21, 2016. 3 Letter to administration officials from five House committee chairs, December 22, 2015. 4 Letter from Sens. Jeff Sessions and Ted Cruz to Obama administration officials on January 11, 2016. 5 Examples include Zacarias Moussaoui, one of the 9/11 plotters; Richard Reid, the shoe bomber; Ahmed Ajah, a thwarted Al Qaeda bomber; and Ramzi Yousef, who organized the 1993 World Trade Center bombing, among others. 6 W.D. Reasoner, "Upholding the Value of Our Citizenship", Center for Immigration Studies, January 2013. 7 U.S. Department of Homeland Security, "Entry/Exit Overstay Report", Fiscal Year 2015. 8 For more on the DHS report, see Jessica Vaughan, "DHS Reports Huge Number of Visitors Overstayed in 2015", Center for Immigration Studies, January 20, 2016. 9 "Visa Waiver Program: DHS Has Implemented the Electronic System for Travel Authorization, but Further Steps Needed to Address Potential Program Risks", Government Accountability Office, GAO-11-335, May 5, 2011. 10 Dan Cadman, "Is Iran Dictating Terms of the New Visa Waiver Restrictions? ", Center for Immigration Studies, December 28, 2015. 11 Murtaza Hussain, "Congress just put Iranian Americans and others at risk for becoming second-class citizens", The Intercept, December 18, 2015.